States should assemble a core team to take ownership of strategic decision making. Team members must buy into and commit to goals and objectives to maximize the potential gains of information flow. 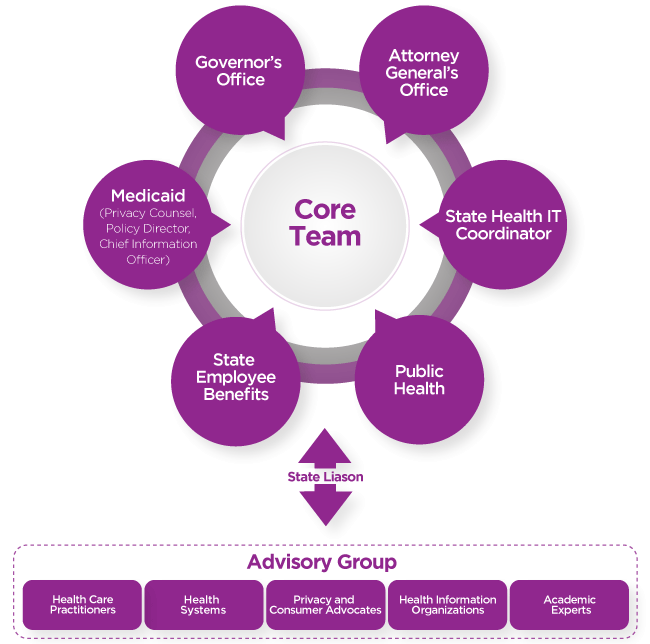 From within government, the core team should, at a minimum, include representation from the governor’s office, Medicaid—including privacy counsel, senior policy officials and health IT leadership—the state health IT coordinator, public health, the attorney general’s office and the agency that administers state employee health benefits. It is important that core team members include senior state officials who have authority to make decisions on policy and strategy. In addition to state officials, states should engage external stakeholders through additional workgroups, advisory boards or committees established to support the core team’s work and make recommendations to the state. External stakeholders should include health care practitioners, health systems, privacy and consumer advocates, HIOs and academic experts. External participants can serve as an initial sounding board for the state and help garner broader buy-in from other stakeholders. Advisory groups can be established by legislative mandate or through gubernatorial authority. Stakeholder champions and entities that are likely to serve as early adopters in the provider community are also a crucial group to involve in efforts to increase exchange of health information. When large hospital systems responsible for significant patient populations demonstrate their commitment to a policy or cultural change, others may feel more comfortable following their lead. State medical societies and hospital associations also can be important allies because they are a trusted source of information and advice for many providers. For example, in Kansas, the state medical society and state hospital association were integral to the development and governance of the Kansas Health Information Network (KHIN), an HIO serving most of Kansas.19 The two societies served as champions for widespread participation among the provider community.